Fishing on the ocean in March is very early for me, but I could not resist with the wonderful weather. 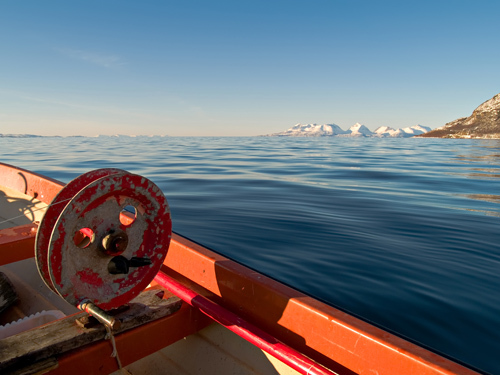 The “wheel” you see in the boat is a fishing device used for deep water. It’s called “juksa” in Norwegian. My grand father made it over 50 years ago and it still works like a charm. In the horizon you can see the island Senja, the second largest island in Norway. Wow, what a gorgeous shot. Cool story. What type of fish do you go for in March in Norway? I do some ice fishing in Michigan and it’s mostly perch, crappie, Blue Gills and Pike on the smaller lakes.